Saint Gall was born in Ireland soon after the middle of the sixth century, of pious, noble, and rich parents. He was raised in a monastery during his youth, under Saint Colomban and Saint Comgall, his Abbot. When Saint Columban left Ireland, Saint Gall accompanied him into England and afterward into France, where they arrived in 585. In a wild forest of the diocese of Besançon, Saint Columban founded the monastery of Annegray, and two years afterward another in Luxeuil. Driven away by a hostile king, the two Saints withdrew into more propitious regions, eventually going into Switzerland, near Bregentz, a village on Lake Constance. The idolaters of the region were greatly irritated when Saint Gall preached to them and broke three statues, throwing the pieces into the lake. Many, however, were converted, and Saint Columban was able to purify and dedicate a formerly idolatrous chapel, which had once been a small sanctuary honoring a Roman martyr named Saint Aurelia, and consecrate an altar for it, where Mass was then offered. The disciples who had remained behind the two Saints, rejoined them at this place and built cells around the chapel. When the Saints learned that the hostile king who had driven them out of France now had conquered this Swiss territory also, Saint Columban went into Italy; Saint Gall was prevented by a grievous illness from accompanying him. 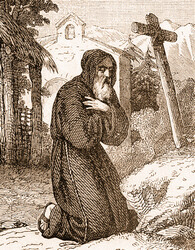 Saint Gall had been ordained a priest by the command of Saint Columban, and now, having learned the language of the region where he settled near Lake Constance, he cast out demons, lived in peace with the wild animals, drove serpents from the valley, and converted to the faith a great number of idolaters. The cells which the Saint built there for those who desired to serve God with him, were attached to the monastery which bears his name. A synod of bishops, with the clergy and people, earnestly desired to place the Saint in charge of the episcopal see of Constance; but his modesty refused the dignity, and one of his disciples was chosen instead. He died in the year 646. Reflection: Our Lord says, If any one would be My disciple, let him deny himself and take up his cross every day. The denial of self is, then, the first step on the royal road to perfection.